Good afternoon everyone, I was expecting to have the last talk before dinner. [Laughter]. 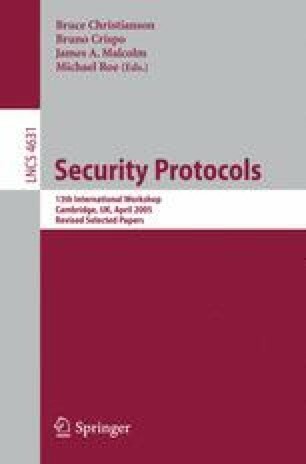 We’re going to take a slightly less serious look at some of the work that George Danezis and myself have been doing on trying to find exciting, or at least interesting, new ways to think about security protocols, and to find environments that encourage us to find interesting new protocols. Our chosen environment is Secret Societies, and although there are all sorts of things in there, we’re going to concentrate mainly on membership testing, and look at some of the algorithms that you might use to figure out whether or not somebody is a member of your secret society, or try and decode whether or not members elsewhere are members of their societies. Then we’ll go on to figure out if we can take what we know from what we read in books, and stories, and history, and do it a bit better using our skills from cryptography, and we’ll look at a couple of models that we have for that. And then I’ll present one protocol to you, and show how we built it up, which tries to do authentication between two people in a better, more interesting way.